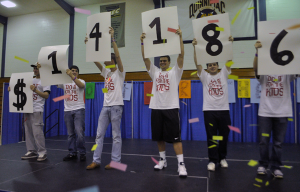 Quinnipiac’s inaugural Dance-A-Thon raised over $14,000 for the Connecticut Children’s Medical Center in Hartford. About 380 students attended Delta Tau Delta and the Student Programming Board’s event last night in Burt Kahn Court to dance the night away, while supporting the cause. The goal was to raise at least $10,000, former Delt President Neil Brown said. “I feel like this is such a great event because people who come get to physically see the kids that the money is going to,” Brown said. Delta Tau Delta fraternity and SPB raised more than $14,000 in Friday night’s Dance Marathon at Burt Kahn Court. 7-year-old Olivia Bellefonte and her family were one of the five families who came to last night’s event. Bellefonte was born with half a heart, and had to under-go three heart surgeries, her first when she was a day old and the last when she was 4 years old. “The [medical center’s] facilities are outstanding, and they have rooms for parents to stay in overnight, which is funded by events like Dance-A-Thon,” Bellefonte’s father said. Olivia said her favorite part of being in the hospital was being able to ride in a battery-powered Barbie car to surgery. Students paid a $10 entry fee, however there were also donations from the outside community. Brown said focusing on “dancers, not dollars” is the key for this event to grow, because if students see that this is a fun way to get involved then the money will come. Delt is hoping to expand the event to more groups within the Quinnipiac community next year. “I think it’s really important that there are families here who have benefited from fundraisers like Dance-A-Thon because we get to hear their stories instead of just raising a bunch of money and signing a check,” junior and Delt member Tom Booth said.